Bart Millard couldn’t have imagined the impact a hastily written song would have on the world when he first penned I Can Only Imagine, alone on a tour bus at 2 a.m. But the song—composed in just a few minutes—is still being played on airways nearly two decades after it was written. Now, a major motion picture is capturing the story behind the hit song. The film, I Can Only Imagine, premieres today (March 16) in more than 1,600 theaters nationwide. While you can probably hum the chorus of the catchy ballad that inspired the movie, here are 13 facts you might not know about I Can Only Imagine. 1. I Can Only Imagine is the best-selling Christian single of all time. Having sold more than 2 million digital copies, I Can Only Imagine is the only song in the Christian music genre to ever go double platinum. 2. The song had great mainstream success despite prominently mentioning Jesus in the chorus. I Can Only Imagine crossed over to pop and country radio. It peaked at no. 33 on Billboard’s Mainstream Top 40 and no. 52 on Country Airplay. 3. Millard wrote the song in 10 minutes. Millard says he came up with the song in the middle of the night alone on a bus after a concert. He was moved by the phrase “I can only imagine,” written in a notebook he was thumbing through at the time. The entire song came together in a matter of minutes. 4. The music video has some famous cameos. Inspired by fans at concerts showing the band photographs of deceased loved ones, the music video for “I Can Only Imagine” features people holding empty picture frames that eventually house photos of those they’ve lost. In addition to MercyMe and everyday people, several CCM artists appear with images of their deceased loved ones—Michael Tait of dc Talk and Newsboys, Bob Herdman of Audio Adrenaline, Jesse Katina of The Katinas, and Tammy Trent. 5. I Can Only Imagine has been played in space. The song served as a wake-up call for NASA astronaut Barry E. Wilmore on mission STS-129 to the International Space Station. 6. The song was not the first single released from MercyMe’s Almost There album. That honor went to Bless Me Indeed, a song inspired by the book The Prayer of Jabez. 7. I Can Only Imagine was inspired by the death of Millard’s father. Millard was a teenager when his father passed away after a battle with cancer. 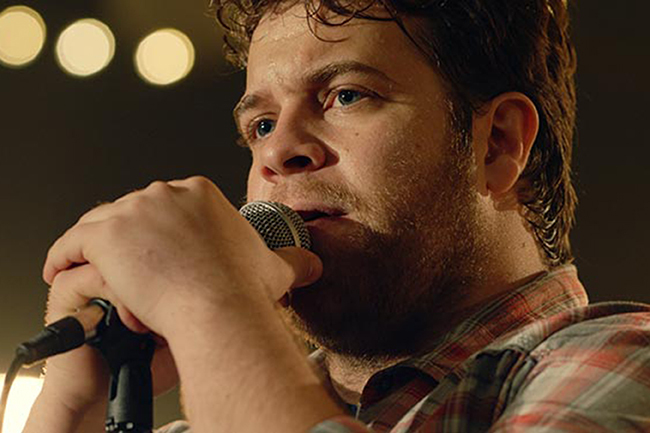 Millard says the song—written a few years later—helped him focus on Christ rather than the pain of losing his father. 8. There’s another reference to Jesus in the song. The second stanza of the song features the line, “I can only imagine when that day comes when I find myself standing in the Son.” While it may not be clear on the radio whether the word is “sun” or “Son,” it’s another reference to Christ. 9. I Can Only Imagine changed the musical image of MercyMe. Millard says MercyMe was a rock band when the group got its start. However, the popularity of I Can Only Imagine—written as a piano-driven ballad—caused the band to primarily be recognized in the adult contemporary genre. 10. The song dominated the Dove awards. I Can Only Imagine was named Song of the Year and Pop/Contemporary Recorded Song of the Year at the 2002 Gospel Music Association Dove Awards. Millard also took home a Dove award the same year for Songwriter of the Year. 11. I Can Only Imagine ministered to people after 9/11. MercyMe released I Can Only Imagine on the Almost There album on August 14, 2001—just 28 days before 9/11. The song, which evokes hope in the life to come, became a comfort to many Christians as they processed news of the terrorist attacks. 12. The song has been covered by many artists. While MercyMe has the most-recognized version of I Can Only Imagine, the song has also been covered by Amy Grant, Wynonna Judd, Emerson Drive, Marie Osmond, and Tamela Mann. MercyMe also recorded a version of the song with the London Symphony Orchestra and released a special rendition to go along with the movie. 13. The movie has generated significant buzz prior to its opening. As the movie opens in theaters today (March 16), the trailer has been viewed 47 million times on Facebook. In preview showings on Thursday night, the film surprised industry insiders with a $1.3 million one-day haul. This week, Bart Millard shared that the film was the top seller on movie ticket site Fandango. Soooo currently we are the top selling ticket on Fandango. YIKES!!! This film brought me to the previously unattainable point of being able, finally, to forgive my own father. No question God’s hand directed the creation of this film and likely led thousands of people to forgiveness. Listening to this after watching the movie tonight. Well, I have listened numerous times as tears are pouring down my cheeks, I lost my Dad suddenly in 1988 and still can’t get over it. He played with all 8 of us kids daily after working hard long hours. He always found time to take us on vacation when the plant closed in July. He come to watch us all play sports after work. One day, in 1988 he went in for hip surgery and the doctor retired hi. For a two year recovery so he never had to work again. Mom and him purchased a home here in Florida. The day he came home, he died. Never seeing retirement. So sorry for your loss. Your words were touching. May the Lord give you and your Mom comfort. Your dad is st peace and with the Lord, as we “can only imagine.” I lost my husband and soul mate of over 51years just 4 weeks ago. I found the song and the movie to be of great comfort, imagining how my guy is now in the presence of a Jesus and getting all his questions answered. That is what he looked forward when he knew his entire system was failing. He just wanted to be able to get these questions answered and really see Heaven. He always always said “I can’t hardly imagine” how it will be to see Jesus. He is now learning. It’s so lonely without this awesome man in my life but he was sick for so long. He is at peace and died here at home, with me and our daughter here with him, as he slept at the same time we always woke up.